Daniel, who was once a blacksmith's slave, has been living among a band of rebel outlaws in the mountains above Judaea for some years, waiting for Rosh, their leader, to find a way to free his people from the Romans, who were responsible for the death of Daniel's parents. When Daniel unexpectedly meets his old friend Joel and Joel's sister Malthace, he inquires about the health of his ailing grandmother and demon-possessed sister and finds himself pulled back into community life once more. While living in Capernaum and working as a spy for Rosh, he begins to learn about Jesus of Nazareth, whose message of love stands in direct opposition to Daniel's desire for revenge on the Romans. Daniel must choose whether to follow his anger or his heart. Like Pharaoh's Daughter, this book includes fictionalized references to a Biblical figure, but these do not cause the theological conflicts created by Pharaoh's Daughter's rewriting of the Moses story. In fact, when Jesus speaks, even when he is talking with characters invented by the author, he uses words that have been attributed to him in the Bible, or words containing messages consistent with scripture. He is presented in a way that is consistent with Christian teaching, and which will not offend readers, whether they believe in him as the Messiah or not. Not only does this book portray Jesus favorably, it is also inclusive of the various factions and figures who make up first century society in the holy land. Zealots (including Simon the zealot), rebels, women, children, thieves, and slaves are all present and each group is represented by at least one fleshed-out character who contributes something to the main plot. This book is as much a portrait of the time period as it is a specific story about Daniel. This book includes two very effective metaphors. One is the bronze bow itself, which serves as a password for Daniel and the young men he recruits for Rosh's army. It refers to a line from the Song of David -he trains my hands for war, so that my arms can bend a bow of bronze - and serves as a powerful representation of Daniel's desire to best the Romans. The other is Daniel's attitude toward a Roman soldier with whom his sister falls in love. His treatment of this specific soldier changes throughout the story as his overall attitude toward Roman rule changes. This book would be a wonderful text for helping young readers better understand the role of metaphors in narrative writing. There are many themes and lessons to explore in this story, and each reader is likely to favor a different interpretation of events. Daniel's struggle to choose between Rosh and Jesus raises important questions about peace versus violence, belief versus unbelief, and accepting versus shirking one's responsibilities. It also provides opportunities to discuss how we treat the weak, the old, the disabled, and the needy in society. This book is not just entertaining; there is much to learn, both academically and morally, from reading it. 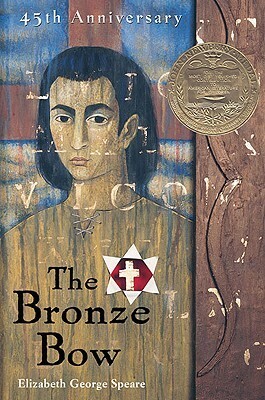 Coincidentally, The Bronze Bow was the winner of the 1962 Newbery Medal, the same year in which The Golden Goblet received a Newbery Honor. I listened to portions of the audiobook, and the narrator has a great voice, but an unfortunate problem sticking with one pronounciation of Capernaum, which is very distracting.